The les atkins Photography/Atkins Ad Group rockfish, "Fisheye," is a unique look at Roanoke Rapids’ past. 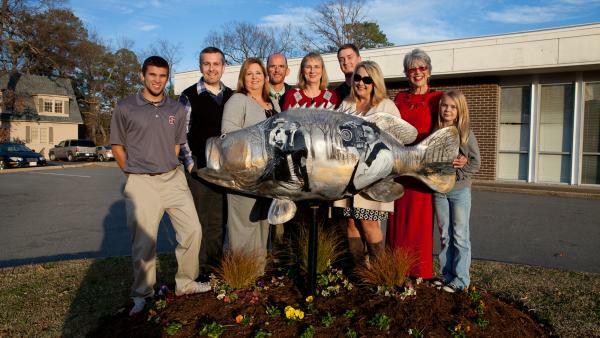 One side of the rockfish features a 1920s couple being photographed on the banks of the Roanoke River. Artist Tina Gregory captures every detail of this couple’s photo session. The 1920s was a pivotal time for photography. Photographs actually started to replace drawings in advertising as people thought the camera wouldn’t lie. les atkins Photography opened in 1995 and offers a wide variety of photographic services including wedding, event and corporate photography. The Atkins Ad Ad Group is a full service advertising agency that opened in 2006, and expanded in 2009 to serve eastern North Carolina and southern Virginia in the areas of public relations, logo development, branding, media placement, video production, event marketing, graphic design and website development.